Sometimes I wake up with an urge for something special – food related, that is. This morning after my first cup of coffee I started thinking about Shanghai Chicken Fried Rice. I worry about my early morning thoughts, especially when they are not related to women or wine, but whatever – I can’t control my thoughts all of the thyme. That last sentence rhymes, in case no one noticed – a poet and didn’t know it. Every Chinese restaurant offers fried rice. Actually, every Chinese home eats fried rice frequently and for a very simple reason – it’s typically a leftover dish and is used to clean out the cupboard or whatever the Chinese use to store food. I don’t mean to be impolite – I have traveled in China and have worked with the Chinese in business. I love them, but I don’t know what they call the area where they store food. But, I digress. Here’s the story: To make fried rice, you need rice that has already been cooked and no matter that it was cooked yesterday or two days ago – all the better. Some say you must start with old rice that is dry and ready to throw out. Now we look in the fridge and see what we have. A little celery and carrot – we almost always have these basics. How about some onion, garlic and eggs? GEE WHIZ, we have everything we need. So, let’s prep all of the ingredients, turn on the stove (in that order), and get started. The one thing you might not have is a good soy sauce. Bravado Cooking prefers Tamari Soy Sauce. This is a darker, richer variety and is based on the most ancient of Chinese recipes. I’m not sure that means much, but it sounds cool. This dish is so easy that you will be astounded. Keep that to yourself as a true Bravado chef should do. Wait for the moment and call your friends and tell them you have an urge to make your famous Shanghai Chicken Fried Rice. Invite them to come and watch you prepare it. Cook the rice and fluff with the butter. Set aside. You can do this a day ahead of time if you wish. Prep all ingredients. Make sure you have put salt and pepper on the chicken. Put the ingredients in little bowls like they do on TV. This will make it appear that you know what you are doing. Heat the olive oil and sesame oil over medium-high heat in the largest pan that you have – preferably a wok. Add the celery and carrots and cook for another 3 minutes. Add the chicken and cook until thoroughly brown. Add the rice and the soy sauce and stir fervently until everything is well mixed. Add the eggs and stir again with renewed ferver. Remove from heat, take the pan to the table, and serve immediately with a cold Sauvignon Blanc and broccoli. Make sure you have a little extra soy sauce for the table. This produces, arguably, the best fried rice you have ever tasted. 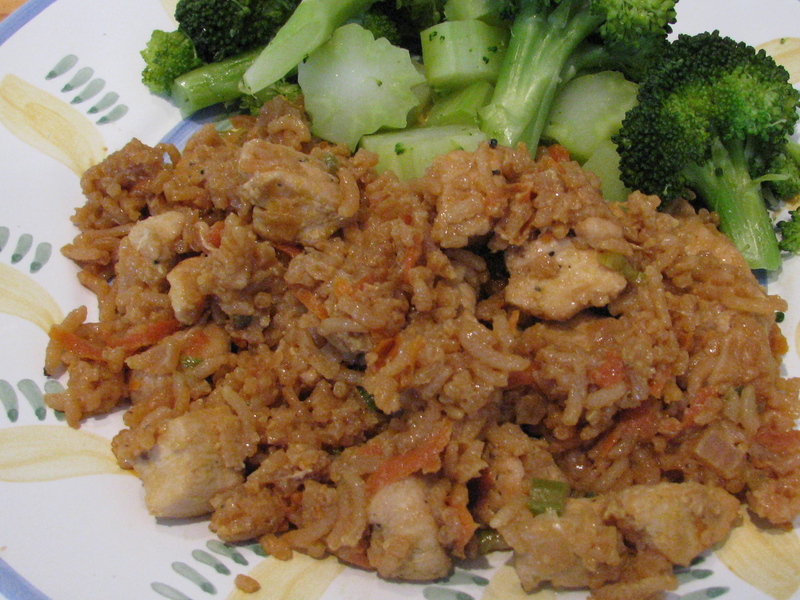 It is a moist and rich rice that everyone will gobble up. It may seem strange to some of your friends who are aficionados of low-light budget Chinese restaurants and have managed to ingest the more pathetic versions, most of which foreswore moistness long ago. If you have leftovers – a big IF – you can have a fried rice scramble for breakfast. I assume you will be able to figure that out, although you will miss a crucial ingredient for this AM serving – the hot sauce – a traditional Tabasco is just fine.